Telegram is the Best, by far. 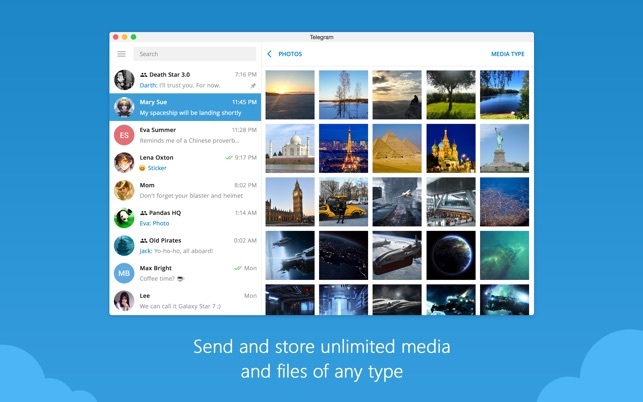 I usualy don’t mind myself to write review, but I think Telegram deserves it. 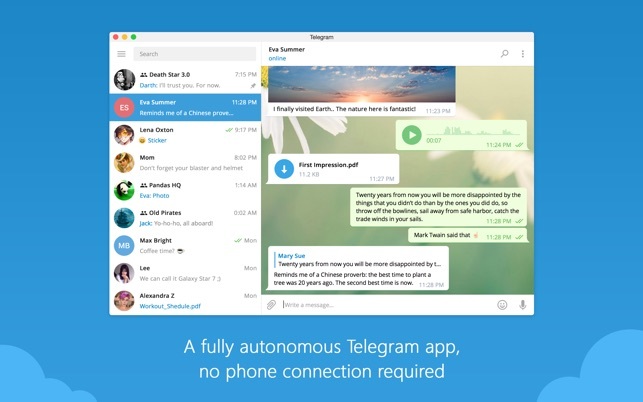 I’m a Telegram user from the very begining of its release and I have never seen any downside in it - I mean it. It’s getting better and better by each update, while other alternatives such as Whatsapp have nothing to say. Although I have to use Skype and Whatsapp for connecting some specific people, I never suggest them (unless for Video call). Since I started using it, I’ve never seen a crash, a bad update or anything. I think the software engineers behind Telegram are genius!! 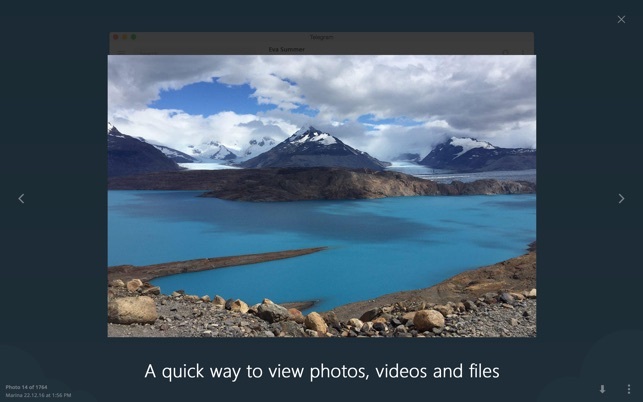 I noticed the "Telegram” app in AppStore is updated with latest features such as Group Photo. However, this app (“Telegram Desktop”) which is much more user-friendly in terms of UI and in particular the way it shows the replied messages didin’t get those features. I want to ask you to give the same exprience to “Telegram Desktop” users as soon as possible, please. 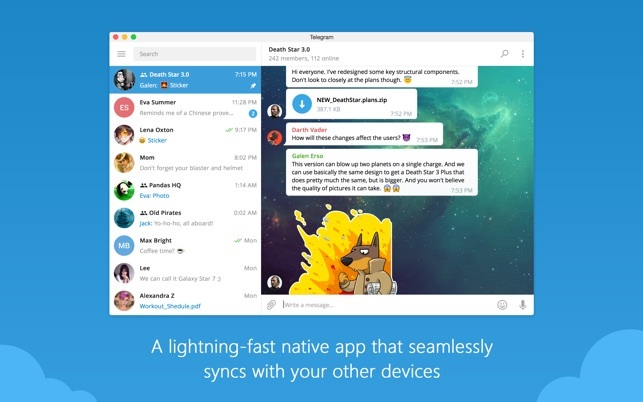 I downloaded this app on my mac first because someone that I really do not know wanted to chat. So why would I want the person to have my phone number? This app says NO PHONE NEEDED. Sounds good. So I downloaded it. It tells me to download on a phone first and requires my phone number. So I did that. Then I find that others contacting me through this app need my phone number. So what is the point? All cellphones have a messenger. Especially iPhone. What is the point again? I don’t do facebook nor do I have a google email and I don’t want them either. That is my point for even searching for such an app. Technology companies. (uhHmm) has to work with authoritarian regimes like Russia, Iran and USA(NSA). They will sell out their souls so that they can monetize. It is not uncommon for "East India company" to exist in the Modern world - large "Consumer Product" or large "Online Distributor” or large “Search & data collection” company, they all exist, and we all use it. It is time for the consumers to exert their rights!! Thank you Telegram for being mechanism that extends the voice of the people. As long as Telegram exists - not Russia. nor any "Consumer Product company” will be able suspend our right - to think! Or to speak!